This is an 12 minute screencast highlighting FREE apps and websites along with the steps to create a “texting story” or SMS conversation video. Access the 15 links referenced in this screencast using this OneTab list. This video is available for non-members of the Videos by Wes Video Library till 23 September 2018. After that date it will just be available to members. Please join today! To receive a weekly email including more video tutorials like this, sign up for Wes Fryer’s “Speed of Creativity” email newsletter! We are hearing more about BYOD (bring your own device) initiatives in many school districts these days, but what kinds of technology integration projects can teachers and students realistically do when some (but not all) students have smartphones and the teacher has one laptop? Today’s smartphone (or the smartphone of four years ago, which students may have inherited from parents or older siblings) can be remarkably powerful, but the BYOD environment can make technology integration even more challenging than a 1:1 situation when all students have the same technology equipment and software. Paper-Slide Videos are one practical type of technology integration project which can work well in a BYOD setting, and in this post I’d like to share some lessons learned from last week when I helped one of the 7th grade geography teachers in our district facilitate a three day paper-slide video project which ultimately culminated in 33 short videos (most less than 2 minutes long) being uploaded to his YouTube channel on Friday. To learn more about paper-slide videos as well as access the rubric and planning guide for this project which we co-created, please refer to the “Quick Edit Video” project page in Mapping Media to the Common Core. 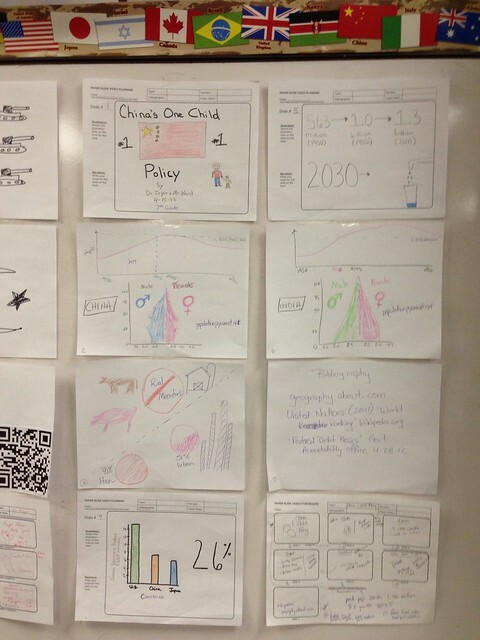 Paper-slide videos are BYOD projects your students CAN do with guidance and facilitation. I recommend you give this project idea a try after you review some of these lessons learned. Phillip Ward (the 7th grade teacher) and I had many cards stacked against us for this project: It is testing time in Oklahoma, so no computer labs were available for checkout and use. The library was closed for testing 2 of the 3 days, so its computers weren’t available either. There are not any mobile laptop or iPad/iPod Touch carts available for any teacher to use in our 7/8 middle school building, so literally the only technology devices we had to use were his Macbook Air laptop, his desktop WindowsXP computer, and any mobile devices the students could bring to class. We designed this project to take 3 days, and serve as a culminating activity for the past several weeks when students have been studying Sub-Saharan Africa. These are some of the key lessons learned and takeaways which I had from this project. 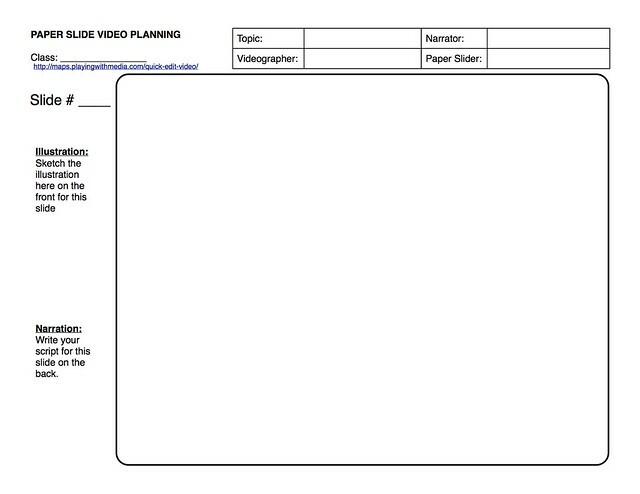 The most important tool Phillip and I created together during several meetings in the weeks preceding the paper-slide video project was the three page planning guide and rubric which students used all three days. This was based in-part on a rubric and guide Mary Frazier, a Technology Specialist in Buhler, Kansas, shared online a few years ago at the MACE Conference in Manhattan, Kansas. I work as an “Innovative Instructional Coach for Common Core” in Yukon Public Schools, and it was very important to both Phillip and I that we built in higher-order thinking questions which would require the students to go beyond fact/recall in the project. On page 1 of the student document, we outlined expectations for each slide of the project. Slide 1 and slide 7 were straightforward: a title slide and bibliography / works cited slide. Slides 2 and 3 were fact slides to build background knowledge. 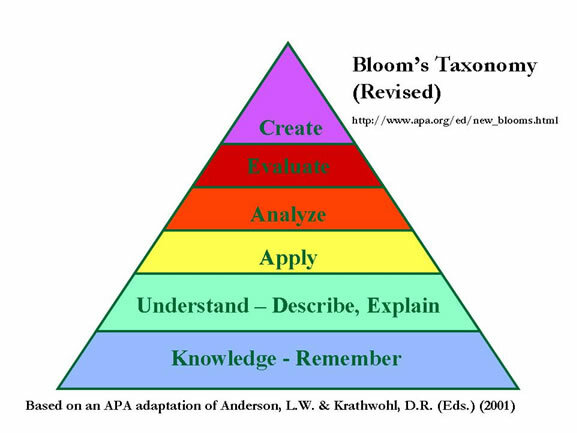 Slide 4 is where the higher order thinking kicked in: Why is this topic important to study and understand? Slides 5 and 6 continued with open ended questions the students had to answer, which do NOT have answers which are readily Googleable. Page 2 of the planning guide was the class exit ticket for day 1: Students were required to decide in their groups of 2 or 3 who would be responsible for each slide. Students started brainstorming topics and used provided print articles about their assigned subject (which were almost all different) to begin their research process. This seven slide storyboard proved to work well for the three class periods students had to complete their projects from start to finish. It provided enough structure and guidance that students weren’t lost or unsure about what to do, but still provided room for student creativity in their projects. Since not all students had a smartphone with access to the Internet, Phillip prepared packets of 1-2 articles per topic for the students to use for research in the project. This provided students with instructional materials they could read and use for their reports, and also sped up the research process since students didn’t have to find and vet sources themselves. I wish we could have provided each student group with at least 2-3 printed articles, but it worked with each group having just 1 or 2. This answer isn’t in the article. This was, in fact, my favorite part of the entire project: Getting to have important conversations with students about historical events and current events. Many of these conversations showed how VERY important lessons and cognitive expectations like these are. SO many of our students have no idea that the United States is still at war in the Middle East today, using drone aircraft as well as military and covert forces to kill suspected terrorists on a weekly basis. Many students don’t understand and can’t explain the reasons why the United States chose to intervene militarily in Iraq and Afghanistan but hasn’t intervened militarily in Darfur and didn’t intervene in Rwanda to prevent or stop the genocide in 1994. These conversations reminded me a lot of why high school and college extemporaneous speaking is SUCH A wonderful and valuable event. Students have to understand and take ownership over their learning to a MUCH greater extent when they are required to speak about a topic and even just carry on an intelligent conversation with someone else about it. I wish we made more time in classes for discussions like these. The requirement to ask students to go “beyond the facts” and utilize higher order thinking skills to summarize, synthesize, evaluate and create is one of my favorite elements of Common Core State Standards. Many students were challenged by the requirement to draw illustrations which highlighted the ideas they were going to share for that slide in their project. Non-lingustic representation is one instructional strategy which Robert Marzano highlighted in his 2004 meta-analysis of educational research, “Classroom Instruction That Works.” It’s a key part of several of the media projects in Mapping Media to the Common Core digital literacy framework, including Narrated Art, 5 Photo Stories, and Visual Notetaking. Phillip did a better job than I did during the actual project work “acting like Socrates” when students asked, “What can I draw for this?” Often his answer would be, “I don’t know, what do you think?” This encouraged students to stop acting like dependent learners waiting for guidance from the teacher for everything they did in class, to instead becoming more independent learners thinking for themselves and also collaborating with others. Phillip wisely chose (for his situation) to pre-select and assign student groups. This sped up the process of students getting into groups, and also let him “stack the deck” in some cases making sure students with special needs were paired with other students who could assist them in helpful and appropriate ways. 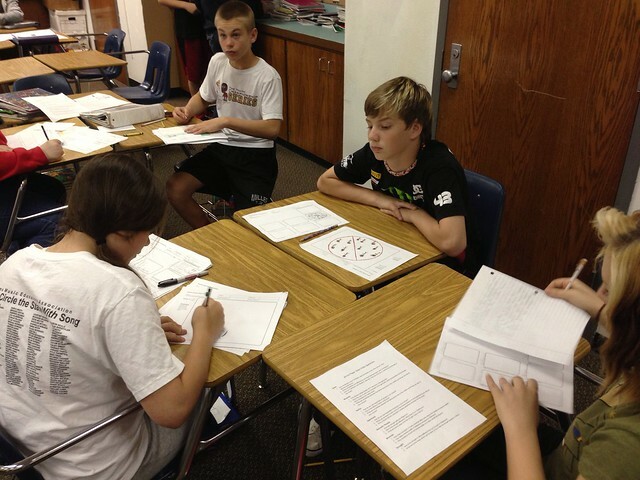 He also avoided grouping students who had historically demonstrated difficulty working with each other. It was helpful to set some time milestones for students during day 2 and day 3 of the project. On day 3, we wrote the class “halftime” on the board and told students that by that time they needed to be starting their video recording. When we got to that halfway point in class, we announced it. 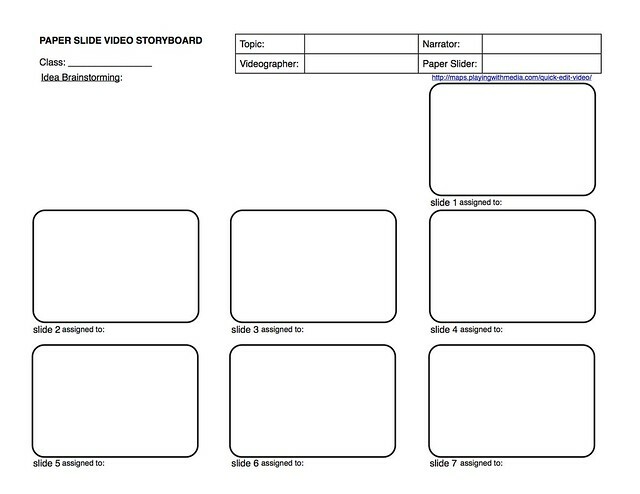 This helped insure that ALL students started recording in time to complete their video by the end of class, and students didn’t waste too much time on some slides that they didn’t have time to create others. This models the idea I picked up for digital storytelling projects some time ago, “It’s never done, it’s just due.” Students had to go with what they had, and use their time as best they could to complete a final product. Because of illnesses in both our families we weren’t able to co-create this project until the morning of day 2, but that proved ok. I created a sample project (“Egypt After Arab Spring”) on my own before we started, and we were able to show that to students on day 1 as we introduced paper-slide videos. Then on day 2, we showed students our collaborative paper-slide video and they were able to identify several ways it was better as a combined effort. 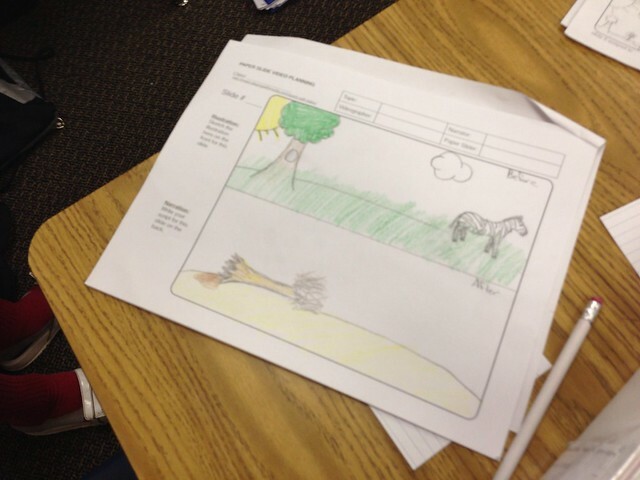 The fact that both Phillip and I took some instructional risks by doing this project and showing students it was ok to use imperfect drawings seemed to raise their confidence in being able to successfully complete a similar project. It also gave us insight into what we were requiring and asking of the students, and helped us identify things we needed to emphasize in our facilitator roles during the project. One of the best things about a paper-slide video project is that it doesn’t require any technology in the classroom until the final day or phase, when students actually record their videos. I knew the project-turn in process would be important to plan and streamline as much as possible, so we asked each student group to bring an iPhone or iPod Touch with video which they could use to record on day 3. Only a few groups weren’t able to provide one, so I loaned my iPhone to some groups and others shared an iPhone. I brought USB cables for both the iPhone 30 pin connector and lightning connector, and used the free application “Image Capture” to copy the student videos onto Phillip’s district-provided Macbook Air laptop. As I copied each file into a folder for that class period on the laptop with Image Capture, I named the file with the class period, project title, and first names of students who created it. 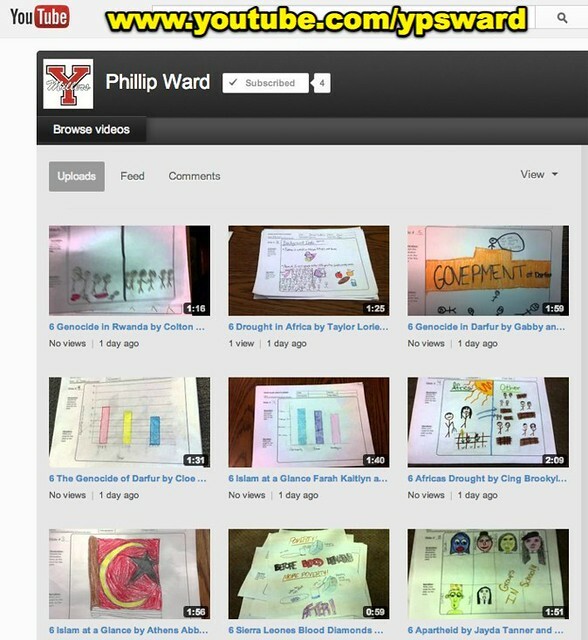 I then immediately uploaded each video to a YouTube channel I helped Phillip create earlier. As I uploaded videos, I used the Mac OS X feature of coloring files to mark uploaded files as “green.” This process worked well and was speedy. One of our student groups had two Android phones, but no iPhone or iPod Touch. This provided an opportunity for me to test the functionality of the free Android application AirDroid, which I’d learned about earlier last week listening to the first Chromebook episode of GigaOm’s Commutist podcast. (Yes that’s COMMUTIST, not communist – be sure you’re not scanning this post too quickly!) Thanks so much to Chromebook/Android guru Kevin C. Tofel for sharing it! 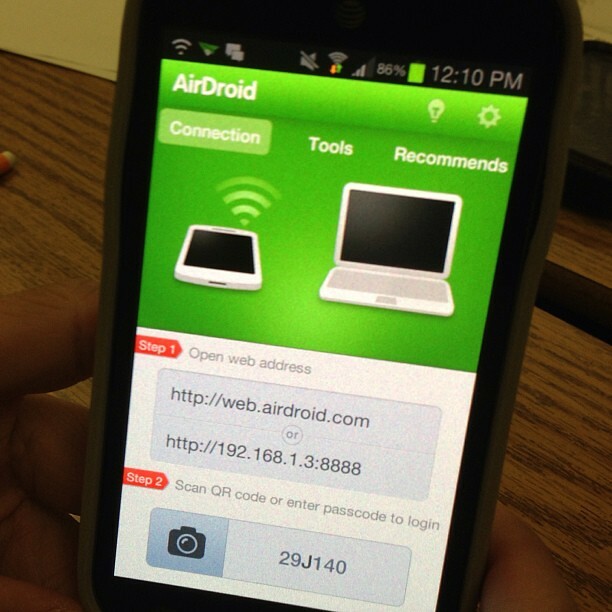 AirDroid lets you use ANY web browser to download video files from an Android device to your computer, provided both your computer and the Android device are connected to the same wifi network with open ports for this sort of thing. Our district public wifi didn’t work, so I pulled out my Verizon hotspot and it worked great. Next week I’m going to talk with our tech director and network admin to see if it’s possible for ports to be opened on our public network so AirDroid can work on it. 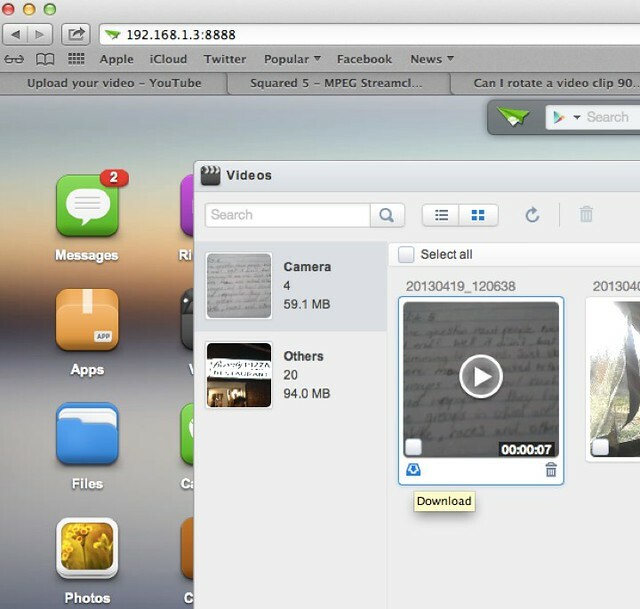 If you know about or have used other solutions for transferring videos from an Android smartphone to a laptop besides Airdroid, please let me know with a comment or tweet. Another very positive aspect of this project, in my view, was the emphasis we put on students utilizing drawings / images with MINIMUM text on each slide. All too often we see PowerPoint abused in classrooms when students (and many teachers) fill slides with text. In the spirit of Garr Reynolds’ “Presentation Zen” book, Phillip and I did our part last week to try and shift students toward more visual literacy in their media presentations rather than an overuse of written text. 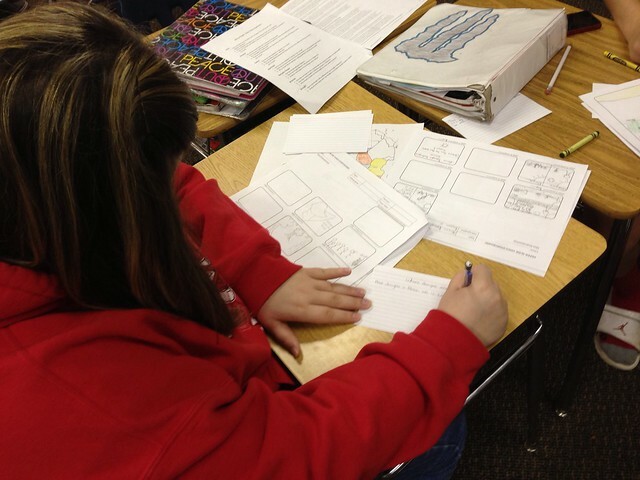 It worked well for students to write scripts and notes for their paper-slide narration on notecards. Some used notebook paper and some wrote on their planning documents, but most used notecards. We asked students before they started recording their videos to hold their smartphones in landscape, rather than portrait mode. This would avoid “letterbox bars” to the left and right of their video, and make the videos full-screen when viewed on a projector. We also asked them to be sure their video mode rotated correctly, so they didn’t record their videos sideways. Despite our warnings, this generally happened at least once per class period. Thankfully, the Mac software program “TransformMovie” is available with a fully-functional, free trial. It can rotate and “fix” a video accidentally recorded sideways MUCH faster than other free programs I’ve used for this like MPEG Streamclip. We did not ask students to create electronic or “clickable” bibliographies for this research project, but I definitely see good possibilities for this using the free web platform list.ly. For more details see my post last week, “Egypt After Arab Spring: A Paper Slide Video Example and List.ly Bibliography.” I also see great possibilities for using printed QR codes to not only help students connect their smartphones directly to research articles so they can follow links for more information, but also to provide scannable QR codes inside paper-slide videos which link to list.ly bibliographies. There were 4 student groups (out of about 37 total) who did not complete their paper-slide video recordings on Friday. Those students are going to finish up on Monday, and Phillip is going to ask all students to respond to some reflective essay questions about the project and what they learned. Feedback so far has been very positive, and Phillip plans to share all the student-created videos in class in upcoming weeks after state-mandated testing is finally over. Once he identifies several of the best videos, I’m going to write a post about this project and share it on the Yukon Public Schools’ Learning Showcase website. I’m also hopeful we can create a short video with student interviews as well as an interview with Phillip discussing the project elements as well as lessons learned. The paper-slide video products Phillip’s 7th grade students created last week are not Steven Spielberg quality digital stories, but they DO reflect a considerable amount of thinking, learning, and collaboration on the part of students. This is a great and practical “Common Core aligned” media project. Hopefully this example can inspire other teachers at Yukon Middle School, as well as you, to consider a “Quick Edit Video” project like this in your own class. Consider a paper-slide video for your next (or first) BYOD project with students!